Funds provided by CMN Hospitals fully support the Child Life program at UF Health Shands Children’s Hospital. This team of individuals are specially trained and certified to help children and families cope with the stress and anxiety of hospitalization. One way these Child Life specialists help children understand and cope with medical procedures is through “Teddy Bear Clinic.” This unique clinic for fuzzy friends walks a child through a procedure using a stuffed animal as the patient. 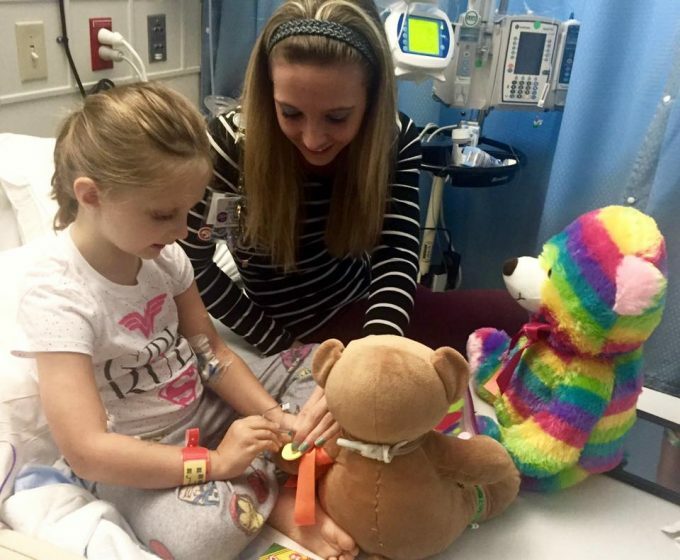 Here, one of our specialists is teaching CMN Hospitals Ambassador Powie how an IV is placed in her stuffed bear. Powie’s teddy bear is also wearing oxygen and has a feeding tube surgically placed, all to help ambassadors like Powie understand the different treatments she endures to help her stay well.